Electric/environmentally friendly vehicles that are equipped with embedded digital communication, in the era of intelligent flows and the Internet of Things, are transforming contemporary architecture and the city. 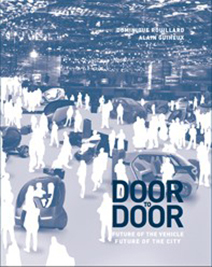 Door-to-door, Future of the Vehicle, Future of the City rethinks urban situations, theorizes and imagines future development models and the new architectural programs that stem from them. It proposes and presents "access spaces", the extension-multiplication of "door-to-door" accessibility in six European metropolises and the repair function of these new tools of connected "auto-mobility", solving urban dysfunctions through their use. The parking facility becomes a program of the future for architecture, while the Electric/Environmentally friendly Connected Vehicle (ECV), a tool soon to be automated, neither noisy nor dirty, moves alongside humans, nature and animals in buildings - the sharing of presences and activities in a "large common space".